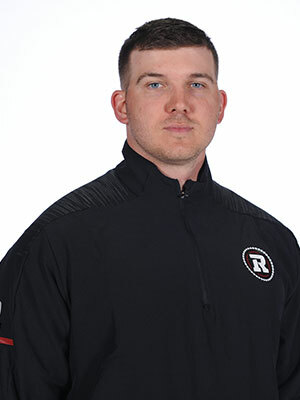 Pier-Yves Lavergne returns to the REDBLACKS in 2017 for his second year as Football Operations Assistant. Lavergne retired from his playing career early last year after receiving an offer from REDBLACKS General Manager Marcel Desjardins to join the club’s front office. After taking a day to think it over, Lavergne has been busy at work ever since. A former player for the University of Ottawa Gee-Gees and University of Montreal Carabins, Lavergne attended rookie camp with the Montreal Alouettes in 2014 and had a tryout with the Calgary Stampeders in 2015 before ultimately joining the REDBLACKS staff in the off-season. A graduate of the University of Ottawa (B.A.A Arts) and Montreal (Msc. Management), Lavergne was also named to the East-West Bowl in 2013 and won the Vanier Cup with Montreal in 2014, the first championship in the program’s history. He went back to the final in 2015 as a Special Teams Assistant with the University of Montreal.